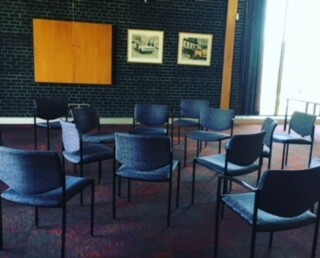 A circle of chairs waiting for the conversation to begin. 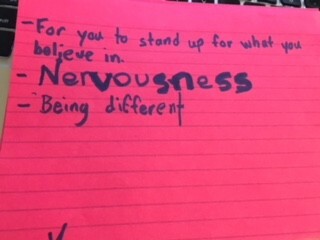 I recently spent a week of afternoons at our local elementary school running a series of workshops about Brave, Honest Conversations with a group of grade 7’s and 8’s. These kids are 12 and 13 years old. I asked them how they feel about tough conversations, and what would be a hard thing for them to talk about, and who they would talk to about it. I asked them how they needed to act, behave and think in order to be in a tough conversation. They were thoughtful, insightful and touching. They were brave, smart and heart-breaking too. They were funny, quirky, awkward and earnest; everything kids at that age are meant to be. These are BIG, heavy issues — for anyone, but especially for 12 and 13 year olds just beginning to navigate the emotional minefield of human interactions. Some of these things continue to be on my list of tough conversations to have and I do this for a living. Like asking for help. Or being myself instead of what other people want me to be. These are universal topics, and they are hard to have no matter your age. I’m grateful the group felt like it was OK to even identify the issues so we could see the things they are thinking about — but not talking about. Here is something that surprised and saddened me. When I asked them who they were talking to about these things, more than half of them said NO ONE. Not parents, family, teachers, coaches or friends. So many of them said they wouldn’t know how to start the conversation, and that they held the view that those they might have the conversation with aren’t interested. The kids talked about how they don’t have dinner with their family most nights, how their parents or family members are too busy with other things, or how they live in the same house but everyone eats separately or hangs out doing things on their own like watching t.v., doing homework, on the computer. Some of the kids said they might talk to a friend or teacher about these things, but for most of them the hardest part was knowing where to start the conversation or how to say they needed to have one. Most of the kids said that they approached tough conversations by avoiding them at all costs. How is it that by this young age our children have already integrated the message that to be vulnerable is to be weak? What does that mean for their future? For their ability to build resilience, emotional intelligence or to solve tough problems? How will they build connection and intimacy with others if they can’t talk about real things? Knowing how to have Brave, Honest Conversations is a LIFE SKILL. Every day doesn’t need to be full of tough conversations, but when you need to have one it matters that you can step into the conversation so you can find your way through. So we started there — what do they see in others who are having tough conversations? There was this beautiful moment when I asked the group to review the list and then take a couple of dots and put them on the things they had in common with youth leaders having tough conversations. It was beautiful to see that these youth could see themselves as leaders who are also brave, courageous, compassionate and more. The look in their own eyes when they saw that these character traits were not about someone else, but were inside them was where the shift happened. I gave the group homework — to interview other people about brave, honest conversations with 3 questions, and to take a couple conversation cards home and see what happened when they tried to have the conversation with their families. All of them conducted the interviews. The majority of them tried to have conversations at home, and we debriefed what worked, and what didn’t. We slowly shifted from a group who was going to avoid tough conversations about feelings at all costs, to a group who was having these conversations and reflecting on their own contributions to the discussion. We got into this rich, deep conversation about what it means to be brave, because the group kept coming back to how important courage is when having a tough conversation, and how hard it is to find it when you need it most. Answers to “what does it mean to be brave?” from 12 and 13 year olds. In the end, we had some brave, honest conversations about the issues the group identified, practicing out specific skills and tools and standing in courage. We talked about what works, what doesn’t and how to keep flexing that muscle of talking about the things that matter instead of avoiding them, because they don’t go away when you hide from them. My hope is that the lessons in those afternoons together will stick, and when a tough issue comes up, they will try to stand in courage and test out their new skills. My hope is that parents, family and friends of youth will choose to be in the conversation with them when they need to have them, so they build a practice and experience of it being OK to walk this path. If you want to have a conversation with youth in your life, here are some of the questions I asked over those afternoons. What are things that are hard to talk about? How do you approach having a tough conversation? What do you need from others when you are emotional or feeling stressed out about something? How do you need to be in order to have a tough conversation? What do you need to draw on? Who is someone you could have a tough conversation with? How would you reach out to them to get started?